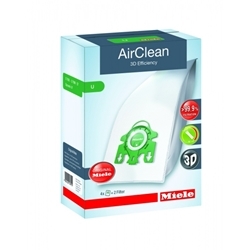 Miele AirClean Style U with 3D efficiency Dust Bags for S7000 Series Uprights All Models between S7000 - S7999 Including the Dynamic U1 Models Miele Twist, Jazz, Salsa, Calypso, Cat & Dog, AutoEco, FreshAir, Homecare, Bolero, Swing and Tango. Miele's revolutionary new dustbags are made of a unique, new material. An intricate web of 9-ply random-spun fibers allow the AirClean bag to retain significantly far more tiny particles and allergens than with any conventional paper dustbags. Now with the new Self-Closing spring activated Hygienic Seal. The enhanced composition virtually eliminates clogging, improving suction performance even further. Each individual package includes: - 4 Air Clean Bags - 1 Bag Compartment Filter - 1 Super Air Clean Filter. Miele Air Clean Style "U" Dust Bags for S7000 Series Uprights All Models between S7000 - S7999 Including the Miele Jazz, Salsa, Calypso, Cat & Dog, Bolero, Swing, Tango and Home Care.